Welcome back, chums! Last weekend I offered forth a fictional story based on one of the creepier Pokedex extras from the realm of Pokemon, and here is a second such entry in that series. If you like these, let me know… I’ll keep offering them up over time. One of them leaves his friends and stumbles towards me with shaky, uncertain steps. I lean just enough out of my shadows to survey if anyone is taking notice as he wobbles nearer and nearer, but I see no one acknowledging him. I begin to leave the cover of darkness to present myself to him when he falls forward to his hands and knees and retches into the mud and grass. This is, of course, followed by the ambulance-pitched sound of his bawling and screaming, and I fade back into my darkness. The last syllable of the last cry seems to stretch for ages as I watch a larger female rush forward, grab the beast by its hand, and yank him back to his feet. I quake in rage at the sound of their insolent argument as the mother scoops her youngling into her arms and steps back to the sea of people. It’s not even the tease of having one so close that boils within me; the shrieking wails of human young are so piercing. Even after he is too far off and mixed in with the sounds of others, the howling seems to live on in my soul. Still, I was close—so close that time—and I am undeterred. The night is young and soon one will be mine. In my youth—back with my bunch—the elders would occasionally talk of places like this. Some called them carnivals, and others, fairs. They spoke of how mature humans would bring packs of their younglings and let them bound about unwatched. It was almost effortless, they told us, to take one unnoticed. Our elders claimed they would be long gone with the brats before the grown ones could ever realize it was gone. We laughed, the rest of us; it all sounded so fantastic. A place where human children were all but offered up to us? Impossible! We chalked it up to the whimsical ravings of the elderly; fairy tales about wish fulfillment and dreams of youth and… it just could not be. It couldn’t. I was not even sure it was real when I spied it in the distance last evening as dusk took the sun away. The cranky mechanical monsters spinning the children wildly and the soberingly pungent odor of overgreased slop and the sounds—oh, the sounds!—the screaming and laughing and crying of free-range children as they ran about in a mass of confusion. It was exactly as the elders had painted it when I was a hatchling. So many years of considering the old sages to be fools, and it was I who was being shown as the real fool after all this time. Their Shangri-La was before me! Just as they described it. I settled into the edge of this carnival when night finally claimed the sun for its own, and here I have waited ever since. The laughing house continues its attempts to vex me by swallowing up the babes, torturing them, and then merely releasing them back into the wild. I try to communicate with it to see if it will share its secrets, but it offers nothing in return. Its lifestyle baffles me, and I do wonder if it is perhaps a psychic creature that feeds off of the mental anguish it inflicts, but has no use for the physical bodies of its prey. What I require of these saplings is certainly of more substance, regardless. And while there is a bit of jealousy that this monstrosity sits in plain sight while the children enter of their own free will, I don’t let it consume me. Even if the house ignores me and patronizes me, the night is still young and soon my prey will find me. We’ll see then if the cackling house thinks that is so funny, too. This fair is hypnotic in its own right. The flashing lights of the tiny stands and thrashing limbs of the spinning beasts are somehow engrossing and lulling. Perhaps that is why the full-growns bring their saplings here; the rhythm of this place dulls their weak, human minds and corrupts them with its own influence. How else could you explain their being so callous towards feeding their children to the large, steel monsters? I am so caught up in marveling at this event that I almost miss it—a youngling, barely out of the egg. He waddles over on unsteady feet to stare at the crowing house. I lean down and slowly examine the area. This child has wandered away from its pack and has no protection. The house begins with its mesmeric laughter again, but no. I won’t let you have this one, creature! This one is mine! I lazily drift out from the shadow to present myself, my appendages dangling low and limp, so as to appear harmless to the hatchling child. For a while, his large, discus eyes don’t leave the house, but I will not let it have such susceptible prey. I start swaying my body more widely, hoping to catch the babe’s eye. His head turns tauntingly slowly to me, and the corners of his lips curl up. His grainy human hands rise up to his chest to meet each other before one extends out to point at me. I cautiously let my gaze scout for his keeper, but no one yet is taking notice of this fool. Secure in my subtlety, I poke further out and watch the child’s eyes soak me in. His hands begin opening and closing on the own at the sight of me. If I’m to be honest, it’s not just the boy that is eager. I’ve never actually taken a sacrifice before today. It’s a shameful thing for one of my kind, I know, but never before has an opportunity so joyously presented itself. I’ve learned since I was hatched that this is what we are meant for—to take these delicate morsels home and sacrifice them to please our lord Giratina—but I myself have never tithed before. I am aquiver with anticipation to please my god as the youngling takes his first step towards me. “Boon!” He cries, now fully believing that I am his for the taking. Yes, young one; come fetch your ‘boon’. I am waiting for you. “My boon!” he declares to the world as he grasps my hand. His is sticky and hot and wet and yet somehow wonderful all at once, and I feel excitement building inside of me. I only know Giratina from the pictures in our books, but in my mind, I can see Him smiling at me. I bob my head down to stare at the boy; he is giggling up at me, in such a fit of glee that his eyes are closed. He won’t even get to see what happens next. No matter how much I pull, tug, or yank, the child moves not. He remains planted on the grass, still laughing and finding great joy in my efforts to lift him away. Every time I jerk at him, his laughter only increases. I am not fun! I am the instrument of your demise! You will never see these other humans again! Your spirit will nourish my dark deity! Does that sound like fun to you? I turn in shock at the approaching voice, and there is little mistaking what I see; the woman with the close-cut black hair is speaking to my prey. Within seconds she will be here to vanquish me—to save her offspring—and I know I must away with this boy! I pull and strive upwards again; the hatchling bounces slightly and claps his hands, but that is all. We do not become airborne. Accursed child, how much deep-fried food did you consume? Come into the night with me! For the moment, I am safe. The woman and child still only see me as a harmless fair balloon. Therein lies my safety; I will merely bide my time until this youngling forgets about me and moves on. Soon he will want the garbage food or to visit the evil house or to ride on the metal giants, and he will surely release me. Then I can search out smaller and less substantial prey. No! Confound you, woman, do not anchor me to this beast! Leave my arms be! You stop this! I will not have it! I again try to soar away from this child and back into the night sky, cursing my bunch. The elders were bastards and liars! These fairs are traps! Brothers! Brothers, don’t fall for this like I have! My insides run cold at her words—so much so that I even lose a bit of altitude—and I look down; my meek limbs are knotted together around the child’s wrist. The child continues to laugh, and then begins shaking his arm with great vigor. My head bounces in the air violently with the alternating slack and tautness of my limbs, and were I capable of such a vulgarity, I would be the next to sick up at this fair. The boy’s other arm is tightly gripped to his mother, who is showing no inclination of letting him out of her sight again. My strength ebbs with the beating the child’s playfulness is inflicting. I came to this fool’s paradise to find a youngling to take back to my den. Fate has cruelly turned, and now I shall be returning to theirs, instead. Knowing what I know about my plans for the boy, I can only dread what their plans for me are. Lord Giratina, hear my prayer: just please don’t let them have ceiling fans. 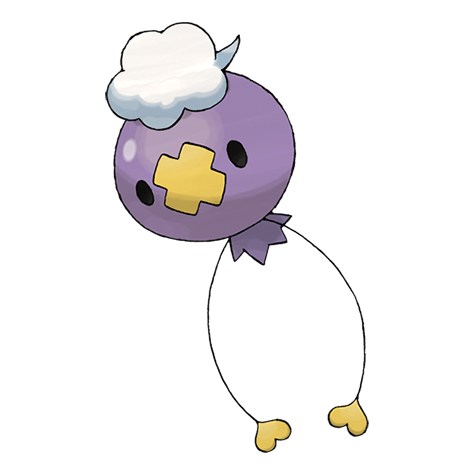 Drifloon: It tugs on the hands of children to steal them away. However, it gets pulled around instead.